Café - a small restaurant where simple meals and drinks are served. What do they mean calling meals simple? Can I order a soup or a steak or fish at a cafe? My lcal café serves steak, battered fish and soup with simple side dishes such as a salads, chips and green beans. What they don't serve would be fine cuisine things like a Chateaubriand with a bearnaise sauce, truffled potatoes and a celeriac purée. The differences are a little 'vague'. A café (by its original definition) was just a coffee house - which sold coffee and maybe cakes and pastries. Since then, they have expanded in scope. 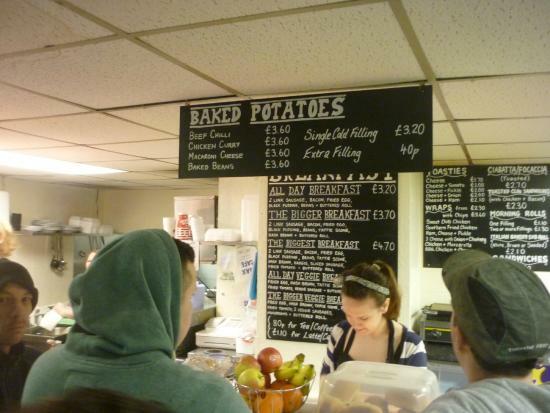 In some "cafés" you can buy meals usually things like burger and chips or fish & chips. In a café you might get "burger and chips". In a restaurant you might get almost the same meal as "minced steak patties with potato strips fried in a blend of vegetable oils, with sesame roll and fresh salad". Thank you for your explanations, Sarriesfan and Drag0nspeaker. The offerings in cafés or coffee shops can be representative of simple regional or national dishes. One of the most memorable specific meals in my life was serendipitously ordered in the coffee shop at a hotel in Ubol Ratchathani, Thailand in 1991: a pairing of Thai-style fried rice with crab and Nuea Nam Tok (เนื้อน้ำตก - grilled, spiced and sliced beef) produced the most wonderful rendition of Surf-and-Turf that I have ever experienced. what is the difference between a bistro and a café...? Dictionaries say that a bistro is a French thing. "Bistro - a small informal restaurant or bar, especially one in France or one in a French style"
Simple meals is when a recipe calls for few ingredients to prepare and tastes great. An example of a simple soup recipe is 1 large can cambell soup and 1 bunh of broccoli. cook on simmer heat on top of stove and stir according to prevent the soup from scorching. Simple meals is when a recipe calls for few ingredients to prepare and tastes great. regardless of what the dictionary says, a bistro is understood now to refer to a small, intimate space selling coffee. They usually serve alcohol too for those who'd like it - but their main purpose is social. The decoration is usually quirky and casual, comfortable and relaxed. They serve some sweet items, but most have their own ideas about food, which usually depends on the natonality of the owner. Here and in London, a large number of them are vegetarian. A cafe is a place where you just go to eat. Not a big occasion - like a restaurant - but for a quick re-fuel. They don't serve alcohol usually, though some may have sell either beer or wine. "Simple" booze. Most cafes, however, will serve high calorie, "simple" meals: eggs, meat, fish, for energy: and piles of chips with everything; as well as sandwiches and tea. 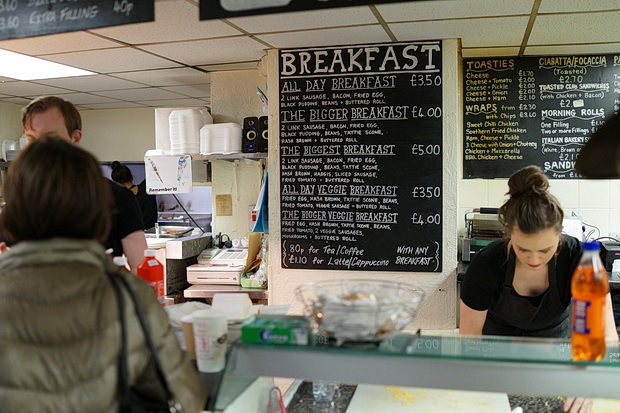 I know in England many "Transport Caffs" - Cafes which are near main roads but not on them, usually.Half the price of a motorway "Services" and twice as much food. As Romany says, the general customers are drivers and people needing/wanting high-calorie cheap meals. The one in the picture here is one I know (I have breakfast there regularly when I'm in town). There are six seats. It is next-door to the local hostel for homeless people. The cook and 'servers' are covered in tattoos and metal bits. But the place is kept spotless. If you can't read the menu, a "Biggest Breakfast" (now for £5.50) is two sausages, two fried eggs, two slices of bacon, haggis, black pudding, Lorne sausage, fried tomatoes, fried mushrooms, a 'tattie scone' (sort of a pancake made with mashed potato instead of wheat flour), hash-browns, baked beans and a buttered roll (or toast). Enough food for me for a day. The growing gentrification - even in the "Bohemian" Laines - here in Brighton, is seeing the end of neighbourhood cafes and caffs.There is only one caff. now - hidden away where tourists can't see it. Right, Drag0. That is a huge breakfast. One should go hungry for at least a day in order to be able to eat up all of those.